Application to Extend Administration; Entry Extending Time-Final Account; Proof of Service; Application for Transfer of Mobile Home in the Estate of Brenda Kay Campbell. Entry Approving and Settling Account; Proof of Service in the Estate of Susie Bender. Consent to Power to Sell Real Estate; Acknowledgment; Waiver of Partial Account in the Estate of Robert Miller. Proof of Service in the Estate of Mary Lou Seitz. 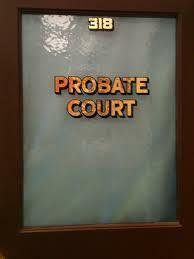 Hearing Notice; Distribution of Proceeds Wrongful Death in the Estate of Ray L. Bennett. Hearing Notice in the Estate of Beverly Elaine Thompson. Waiver of Notice of Hearing on Inventory (2) in the Estate of Ellie E. Good. Entry Setting Hearing; Judgment Entry Order Approving Inventory and Appraisal; Judgment Entry Order Approving Transfer of Motor Vehicle (2005 Chevrolet Malibu) in the Estate of Anna Margaret Weller. Inventory and Appraisal without Real Estate; Schedule of Assets W/Appraisal in the Estate of Gilbert Jesse James. Affidavit of Service of Notice; Application for Attorney Fees in the Estate of Cecil C. Stephens. Affidavit of Service of Service in the Estate of Barbara Stephens. Surviving Spouse, Next of Kin, Legatees and Devisees; Application for Authority to Administer Estate; Fiduciary’s Acceptance in the Estate of Wiley Darvin Collins. Surviving Spouse, Next of Kin, Legatees and Devisees; Application to Admit Copy of Lost Will Receipt:29258 Date: 05/27/2015; Copy of Will Filed; Application to Probate Will: Receipt 29254 reversed by 29255 on 05/27/2015 Receipt:29258 Date 05/27/2015; Appointment of Appraiser; Application for Authority to Administer Estate Receipt29254 reversed by 29255 on 05/27/2015; Fiduciary’s Acceptance in the Estate of Clara Pearl Collins. Application to Probate Will; Entry Admitting Will to Probate; Entry Setting Hearing and Ordering Notice; Entry Appointing Fiduciary; Letters of Authority; Proof of Service in the Estate of Larry Joe Chafin. Proof of Service; Report of Distribution in the Estate of Wilbur F. Lemcke. Application for Authority to Administer Estate Receipt: 29236 Date: 05/22/2015; Surviving Spouse, Next of Kin, Legatees and Devisees; Certificate of Death Filed; Waiver of Right to Administer (2); Motion to Waive Bond Receipt: 29236 Date: 05/22/2015 Consent to Waiver of Bond (2); Fiduciary’s Acceptance; Entry to Waive Bond; Entry Appointing Fiduciary; Letters of Authority; Entry Setting Hearing and Ordering Notice; Proof of Service; Appointment of Appraiser in the Estate of Edeltrud M. Loyer. Application for Summary Release from Administration; Surviving Spouse, Next of Kin, Legatees and Devisees; Certificate of Death Filed; Original Will Filed; Copy of Certificate of Title and Kelly Blue Book in the Estate of Adron L. Counts. Entry Approving Settlement and Distribution of Wrongful Death and Survival Claims in the Estate of Thomas E. Vance. Application for Transfer of Mobile Home; Judgment Entry Approving Transfer of Motor Vehicle; Proof of Service in the estate of Brenda Kay Campbell. Entry Setting Hearing and Ordering Notice; Final Account; Certificate of Service of Account in Heirs or Beneficiaries; Waiver of Notice of Hearing and Consent to Account (2); Return Receipt; Entry Setting Hearing and Ordering Notice in the Estate of Elizabeth G. Gephart. Waiver of Notice of Hearing on Application for Attorney Fees and Consent to Payment of Attorney Fees in the Estate of Jeffrey C. Higgins. Entry Setting Hearing; Inventory in the Estate of Carl Edward Miller. Entry Setting Hearing; Entry; judgment Entry Order Approving Inventory and Appraisal in the Estate of Margaret Lucile Heacock.